If you’re looking for an original way to reach your community with a musical event, why not ask Alex MacDonald and his band to play in your area? They have performed up and down the country in school Assembly halls, village halls and church halls as well as larger venues like the Rothes Halls, Glenrothes and Leith Town Hall and even at the Edinburgh Fringe and in the open air for Picnic & Praise at Urquhart Castle on the shores of Loch Ness. They play mainly Alex’s own songs which are all written from a Christian perspective on life, and many of them tell stories from real life, all in an inimitable blend of Scottish folk rock. The following are some of the reactions to shows the band have done. A9 in The Capstone Centre, Alness was one of the highlights of 2014. Many from the community came to the event and enjoyed a night of fine music and storytelling in song that touched the soul. 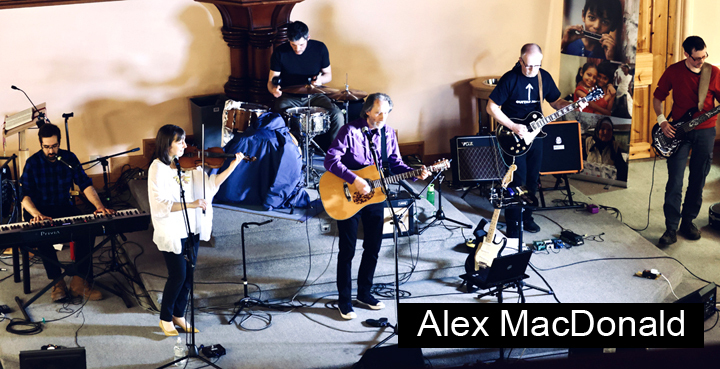 On two occasions we have had the great opportunity to invite people in our community to hear Alex MacDonald and his band playing in our local Free Church in Campbeltown. Those who attended appreciated the obvious gifts of all the band members and how Alex's songs focus on themes common to us all from his perspective as a Christian. Such was the demand for his CD's that we had to re-order. In the words of one man hearing him for the first time: '...that was brilliant - would love to hear Alex again'. The music is stirring and the songs both scriptural and spiritual as they address important issues relating to life, death and eternity. The style is certainly entertaining, but the substance is both evangelistic and edifying and I would warmly recommend the band to any churches who may be looking for ways of bringing the good news to others in musical form. Alex and his band visited our Church last year to raise the profile of the Govan Church Plant. We had a great evening enjoying his distinctive mixture of folk, gospel and traditional. We were able to invite our friends and families along to hear the stories and enter into the songs. It was a unifying, enjoyable and stimulating evening - highly recommended. We took a minibus of young people to the Alex MacDonald evening in Gairloch and they thoroughly enjoyed it as did all the adults who attended. It was an excellent way to share the Gospel and will be remembered for a long time by all who were there. Like the river, the work of the committed Christian never stops flowing. The Rev. Alex MacDonald has recently swapped hats to involve himself in one of his great passions  song. Having played guitar and indulged his hobby as a singer/ songwriter for many years, it is good to see a collection of his work now gathered together on one CD. But for Alex, the music is much more than a mere hobby  as with all that he does, he will see within the medium, the place of the message and the potential for spiritual expression and for the uplifting of the spirit. The arts are an entity that the Scottish Presbyterian tradition has not easily embraced over the centuries, and it is good to see here, a gift recognised and duly expressed. The songs themselves are very much the product of the singer / songwriter genre  folk songs of place and of humanity, sung and arranged with simplicity, honesty and integrity and with no small amount of message. Acoustic guitar, drums and harmonica set the musical soundscape and it is Alex’s talented sons Doug and Rab that provide the bulk of the instrumentation. Alex MacDonald’s great strength as a songwriter is his ability to tell a story and this is perfectly executed on the epic opening track The Fall of Tam Moncrieff  a wonderful monologue in the genre of the story song and the ballad tradition  an engaging tale of good, evil and moral principle. Tom Morton referred to the song as a Calvinist take on Dylan’s Lily, Rosemary and the Jack of Hearts  and it is Dylan (who Alex has always studied assiduously) that is very much the reference point throughout the CD in terms of mood, structure and influence. Other songs on the album range from The Runner, a song written about his brother, who whilst working as a surgeon in India and treating a patient with rabies, caught a reaction to the anti rabies serum and was struck down with MS. He was an athlete in his younger days and would now never run again. There is He Stands a Beggar  the tale of Lachlan Mackenzie, the 18th century preacher from Lochcarron who, when he went to the big city of Aberdeen, was initially looked down on due to his uncouth appearance. By the time he had finished his sermon, you could have heard a pin drop. There are love songs  songs of place and identity  there are the songs of faith  there is the patriotic anthem, Scotland’s Story and there are also two excellent versions of the familiar traditional folk songs, Newfoundland and The Tay Boat Song, the later a tribute to Alex’s father who was a singer of note, and this was one of his favourites. The CD is being released to help with the fund raising initiative for an extension to the church building in Silverton, Kirkcaldy  one of the country’s most socially deprived communities where the church is engaged in ever expanding social and gospel outreach. It is with that in mind that one song stands out as a beacon of purpose for the whole project. Big Man Big Heart is the tale of a man well known in Free Church circles and an inspiration to a generation of many young Highland Christians  the late Rev. Douglas MacMillan. It is poignant to note that it is Douglas’s son Neil that is now the minister in the Kirkcaldy charge. And so the work continues - as it must. Like the river.